The University's OHR web page has a link to the list of eligible voters. For security reasons, we are not linking directly to that list. These are the times and locations for voting. Students can choose their time or polling place with the exception that Duluth students cannot vote in Minneapolis/St Paul and vice versa. Full details regarding the election can be found on the University of Minnesota's OHR web page, which hosts the eligible voter list, as well as the Bureau of Mediation Services' (BMS) Election Order. Not anymore. If you haven't already sent in an absentee ballot to the MN Board of Mediation Services, you must vote in person. But don't worry, voting in person is quick and completely private. Will Anyone Be Able to See My Vote? No. This is a secret ballot, and nobody will look at the ballots until they are ready to be counted. Can I vote "No" if I have Signed a UAW Card? The answer is absolutely, YES. Your signature card is not considered when you vote. Your signature card simply stated that you wanted to have this vote and now that the vote has arrived, you may vote either "Yes" or "No." ANYONE can vote "No" and ANYONE can vote "Yes." Remember many people were intimidated into signing a card or signed simply to avoid being bothered by the union recruiters in the future. If you legitimately are not in favor of the union you should VOTE NO even if you signed a card. Remember the unionization process states "If greater than 50% of voters say 'yes' to unionization then we move on to election and bargaining. If more than 50% of the voters say 'no' to unionization, then the unionization effort is terminated." Can I Support Unions and Still Vote Against This One? Yes, many of us hold this position. Unions should be available for protection of workers, but we see no need for a union in our graduate studies. Have University Grad Students Voted on a Union Previously? 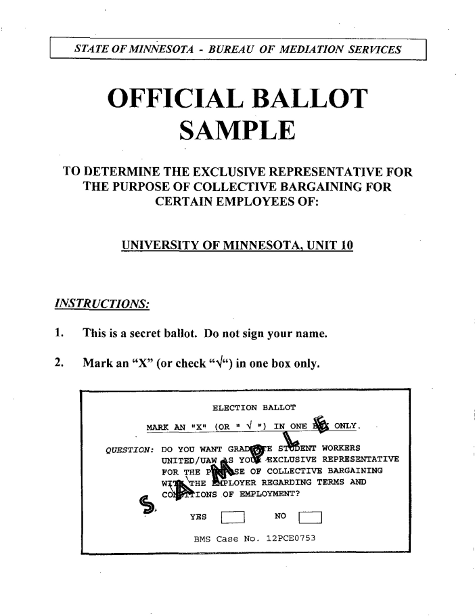 The students at the University of Minnesota have rejected unionization three times already. Here are the previous election results below. Keep in mind, however that this election may well be the one where we are unionized so we need to be proactive about opposing the unionization.